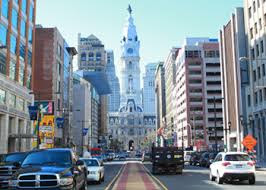 Preservation of Community Assets: Blogger Candidate Forum: Are "Big Liberal Cities" Too Small? Blogger Candidate Forum: Are "Big Liberal Cities" Too Small? Time for the weekly installment of Blogger Candidate Forum. 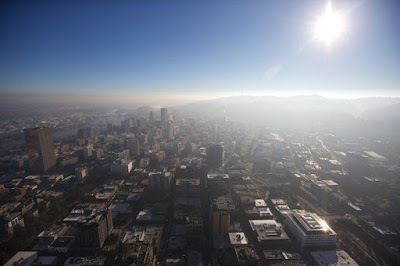 Before we get started on today's subject: liberal cities, Blogger needs to comment on a couple of things. First, in the wake of the horrific Grenfell Tower Fire, a petition was posted on http://www.change.org, banning the use of foam insulation. Please go to this link and add your name to it. Second, yesterday there was a special election to fill the Sixth Georgia Congressional district. Republican Karen Handel bested political newcomer Democrat Jon Ossoff in the race to fill the seat vacated by now Secretary of Health and Human Services Tom Price by a slender 3.8 percent. This follows closely similar defeats in Montana and Kansas, where Republicans held on to hotly contest districts. While the Red Team celebrated, the Blue Team was left crying in their beer (literally and metaphorically). What went wrong? In Blogger's own humble estimation, the Blue Team made these elections a referendum on President Donald Trump, the absolutely wrong approach. The right approach was "the economy stupid." Voters wanted to hear why a Democrat-controlled Congress would be better for the economy, healthcare, immigration, national security, et cetera than a Republican-led Congress. Quit making everything about POTUS and start focusing on the real issues that voters want to hear about. Give voters a real reason(s) to pick you, not another round of POTUS and Republicans are Satan's emissaries on earth. Alright, Blogger is done in the Speaker's Corner, now on to why big liberal cities are not big enough. Richard Florida notes, "Relatively speaking, however, America's cities and metro areas are not that big a fraction of the U.S. economy, compared to cities in other parts of the world." "Metro Share of National GDP"
The map of the left was generated by Mr. Florida's colleague, Taylor Blake, at the Martin Prosperity Institute. 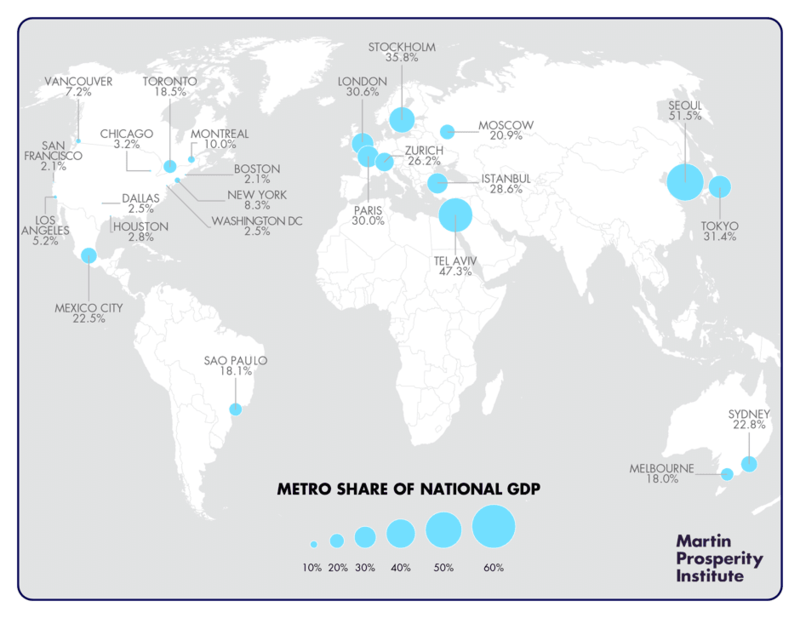 Mr. Blake used data from the Brookings Institution's Global Metro Monitor, which presents the share of national output (GDP) based on a sample of large metropolitans around the world. 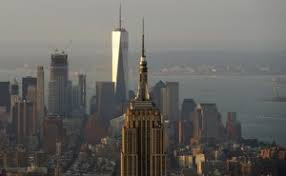 In the United States, New York City "generates 8.3 percent of GDP, Los Angeles accounts for 5.2 percent, Chicago generates 3.2 percent, Houston covers 2.8 percent, Dallas and D.C. each produce 2.5 percent, and San Francisco and Boston kick in 2.1 percent each." By comparison, Toronto accounts for almost a fifth-"18.5 percent of Canada's GDP, Mexico City generates 22.5 percent of Mexico's economic output. Tokyo, London, and Paris churn out 30 percent in Japan, England, and France respectively; in Sweden, Stockholm accounts for 36 percent of GDP. Tel Aviv is responsible for 48 percent of Israel's economic output and Seoul generates more than half of South Korea's GDP." If anything, it really does not square with President Trump's doom and gloom perception of American cities. Quite the contrary, Mr. Florida believes that U.s. cities should be bigger in order to optimize productivity benefits that result from clustering and agglomeration, "while balancing the costs of congestion or the other economic externalities from running a city." All of these statistics and anecdotes help bolster the case for why cities are great, they mean very little in the suburbs, medium- to small-cities which have not experienced the same type of productivity benefits as the liberal big cities. These are the very places where the Trump campaign found attentive audiences who wanted to hear someone speak directly to them about the very issues that affected their daily lives: healthcare, crime, the economy, taxes, et cetera. Thought experiments, like the one Ross Douthat conducts, can be fun but the Trump doctrine is "dangerously anti-city." In reality, "If we are to overcome economic stagnation, generate new innovations, improve productivity, and create new and better jobs, the United States needs even bigger cities-and they need to be both more affordable and more inclusive." 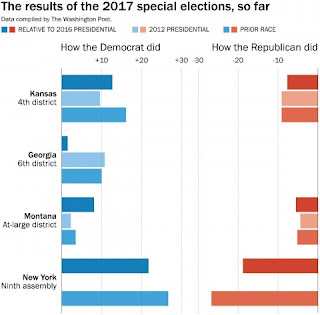 One more thing, if the Democrats want any hope of re-capturing Congress in next year's mid-term election, they will have to formulate a platform that refutes President Trumps anti-city doctrine and not on President Donald Trump.